Stop ruining your important documents, prints, and CD/DVDs by punching them full of holes. 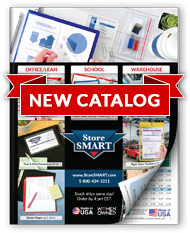 Protect and organize your paperwork and CD/DVD with StoreSMART's Plastic Sheet Protectors with CD/DVD Pocket, instead! Each crystal clear 8-gauge vinyl pocket includes standardized 3-ring binder holes on the left long side for ease of storage, while the top short side opening with a ¼" lip makes loading papers a breeze. The reinforced edges and holes mean you'll never have to worry about the safety of your important business files and collections. The front pocket keeps your CD/DVD with the correct documents. Crafted of crystal clear 8-gauge vinyl. Includes holes on the long left side for use with three-ring binders. Open along the top short side with a ¼" lip. All edges and holes are reinforced. Inside capacity of large pocket: 8 ½" x 11"
Inside capacity of small pocket: 5 ¾" x 5"
Businesses: Use our sheet protectors to store presentation graphs and other printed materials along with the CD/DVD it is stored on.